To the average person the pocket knife has remained virtually unchanged over the years. But as collectors and enthusiasts know, this industry is full of innovation. In fact, I argue that there has been more innovation in knife design over the past 20 years than in the previous 200 years. The Junkyard Dog II Composite (JYD II) is a great example of this, with its ultra cool composite blade. Designed by Tim Galyean, the JYD II is a fantastic blend of fantasy and function and is proudly made in the USA. The JYD II is not a small knife. I’ve read reviews where people are calling it a tactical. I’m not ready to call it that, and review it from that perspective, but I can kinda see where they are coming from. I would say the JYD II is more of a heavy duty EDC/utility knife. In a pinch it could be pressed into tactical use, but I think the blade shape was meant more for daily tasks (and hard tasks at that). Your mileage may vary. The Junkyard Dog II has a 3-3/4 inch blade and a closed length of 4 7/8 inches. This puts it right around 8 11/16 inches overall with a weight of 5.2 ounces. Like I said, the JYD II is not a small knife. You probably won’t want to bust this one out in the office, but it could make for a nice EDC if your job allows it. Some might find it a little on the heavy side but I think it is well worth it when you consider how much knife you are getting. The blade is probably the first thing you will notice (assuming you get the ultra cool composite blade version – which I totally suggest doing if you are interested in this knife). This blade is in fact made of two kinds of steel. Kershaw chose a high end steel for the edge (CPM D2 tool steel), and a tough but decidedly less expensive steel for the rest of the blade (Sandvik 14C28N). From what I’ve gathered this is to reduce cost and make for a cool looking knife. Both reasons sound great to me. On the subject of steel, the D2 edge steel is a great choice, with the CPM version being better. CPM stands for “Crucible Partice Metalurgy” and is a special process developed by the steel’s manufacturer, Crucible Metals. What Crucible does here essentially is powder the steel (by forcing the molten metal through a high pressure nozzle) and puts it back together so the grains are ultra tight on the molecular level. This was a poor explanation, but understand that the result is a finer steel and holds a better edge. Since D2 is already great stuff, we are talking about a pretty fancy piece of steel here. Sandvik 14C28N is less impressive than the CPM D2, but it is still a great steel on its own (used in many popular Kershaw knives, like the Skyline and Scallion) and makes for an awesome “placeholder” for the D2. So you are probably wondering how Kershaw puts these 2 pieces of steel together, and I was very curious myself. Apparently both pieces are laser cut, and then braze welded together with copper. The end result is a single piece of steel which is subsequently finished like any other Kershaw knife. The final bond is very strong. Kershaw claims it is as strong as a single piece of steel. I’ve never heard of the metal coming apart. Ok, so a quick word on the blade shape. Again, I am hesitant to label this a “tactical knife” (not that my labels even matter – use the knife however you like) because of the blade shape. The tip is fairly blunt, and quite sturdy. Great for tough jobs, especially with that D2, but perhaps not the best choice for a defensive tool. Also, I gotta say the blade shape and overall “flow” of the knife kind of has a Ken Onion feel to it. Tim did work with Ken Onion at Kershaw, so perhaps that is where we get this design cue. Personally, I like it. The handle design and construction on the Junkyard Dog II is outstanding. We are looking at fairly typical handle construction: G10 over 410 stainless steel liners. The liners themselves are far less typical because they are some of the thickest I have seen on a liner lock knife. The addition of a FRN backspacer provides even more strength and rigidity (but makes the knife more difficult to clean). The result is a heavily built handle with a rock solid feel. Kershaw did attempt to lighten things up a bit by milling out the liners, and I think 5.2 ounces is pretty good considering how big the blade is and how thick these liners are. The ergonomics are another outstanding aspect of this knife. The very nice (and unique!) 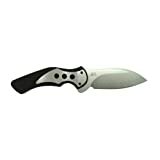 design to the handle fits the hand comfortably and the textured G10 allows for a great grip. There is some jimping on the spine, but it is pretty “round” stuff. Probably due to the finish Kershaw puts on their blades. If jimping is your thing, you might want to modify this one, but I don’t mind it as is. Overall, I am very pleased with the handle design and ergonomics. Now the pocket clip, well, that is probably my least favorite part of the knife. First of all, it isn’t reversible or ambidextrous, and I think it is far too big. I’m not a fan of the wide and flashy design either. The design is more a matter of taste (the look kind of “flows” with the rest of the knife) but I really hope Kershaw addresses the reversible and ambidextrous aspects of the clip. That said, this is an otherwise outstanding knife, and I would seriously consider getting the handle drilled/tapped and a custom low-rider clip made by a knifemaker like my friend STR. Like many Kershaw knives, the JYD II uses a flipper for deployment. I like flippers alright, but I’d love to see some thumb studs on here too – it’s what I’m used to most. That said, the flipper and the phosphor bronze bushings do a great job with deployment and the Junkyard Dog II moves very fast. Something to note is that this knife does not have the speed-safe assisted open mechanism common on a lot of Kershaw knives. I like the unassisted opening so I don’t count this against the knife. I know some people really like the assisted opening knives. I’ve already commented on the liner lock, but just to reiterate, this is one of the more solid liner lock knives I’ve held. Kershaw did not skimp on the steel here and the liner covers almost 50% of the blade when the knife is open – very impressive. Despite this heavy liner, it is still an easy knife to close with one hand. One last thing to comment on is the value, and this knife has tons of it. If you go for the non-composite version the JYD II can easily be had for under $50. You will be hard pressed to find a new knife this big, strong and well made for under $50 folks, that’s just a fact (and it’s made in America too). The composite version is of course going to be more expensive at around $75, but even still that is a good deal for a very nice and unique knife with a high quality edge. Well as you probably gathered, I really like this knife. Combine the heavy construction with a comfortable handle, a great blade and a cool innovation like the composite steel and there is not much left for me to desire. That said, the pocket clip definitely gives me some grief, but I can say that about a lot of knives on the market. All in all this is a very solid offering from Kershaw. Nice review. I like the clip. The wide design allows the knife to ride securely in a pocket although a bit high. A very solid knife at a great price. Thank you, Craig. I agree. A good user for the money. The Junk Yard dog has been the best knife I have ever had. It has been my go to for about 3 years now, and has survived the Appalachian Trail, Construction, and farm work. I have had it professionally sharpened a time or two, but it never fails. Best knife I have ever used/seen. Great for military use, outdoors man, hunting knife, and general work. If I lost it…I would certainly go back to it again. I think its out of the current line up…but can be found on Ebay and Amazon. Great work and knife by Ken Onion. Thank you for sharing your thoughts on the JYD. Glad you have been enjoying yours – sounds like it has been through a lot! my edc knife for about7 years now….takes a licking and keeps on ticking. carried one for 5 years…best folder I have ever owned.